At least five people have been killed in an attack carried out by an Israeli drone in Egypt’s Sinai Peninsula, Egyptian security officials say. The officials, who spoke on condition of anonymity, said on Friday that the victims were militants and that Israeli attack was carried out in cooperation with Egyptian army in the restive peninsula. Last month, Tel Aviv said it had installed rocket launchers near the Sinai Peninsula to counter possible attacks from militants fighting the Egyptian government in the Peninsula. The Israeli military also deployed the Iron Dome missile system in several areas on Egypt’s border. The Sinai Peninsula has been witnessing a surge in deadly violence since the ouster of former president, Mohamed Morsi, by the army in early June. On August 7, unknown gunmen shot and killed an Egyptian politician identified as Abdel Hamid Selmi in Sinai’s northern town of el-Arish. On August 5, an Egyptian soldier was killed and two others injured in two separate attacks in the restive peninsula. Meanwhile, the state news agency, MENA, said in a report that on August 4 unknown militants carried out bomb attacks against two Islamic shrines near the North Sinai town of Bir el-Abd and the area of el-Maghara farther south. In another incident on the same day, one police officer was injured in a militant attack on a police club in el-Arish. In July, there were reports of attacks on military checkpoints in Sinai. Media and security sources said that an Israeli drone on Friday afternoon carried out an airstrike against the Egyptian border city of Rafah killing five Egyptians. The drone allegedly targeted a jihadist group in the city according to Israeli sources. The sources said that the attack was carried out in coordination with the Egyptian army, the Egyptian army however denied any Israeli attacks taking place after saying earlier that it was investigating explosions in the area. Justice means equality. You can choose. You can either put me in jail for twenty years for things that I did or you can release the [Palestinian] prisoners that have done much less violence than me. And since the political power is as it is, they are serving in jail for their share in the violence, and I am free and privileged. If you ask me, I want them to be released and I don’t want myself to serve in prison. 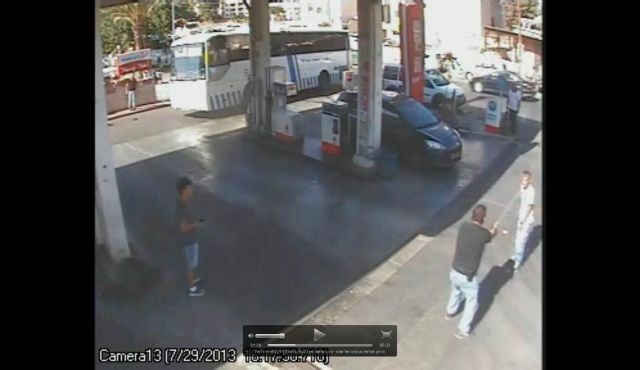 Screenshot from the East Jerusalem gas station shows the officer firing at Mahmoud Abu Sneina. Officer claims he opened fire on Mahmoud Abu Sneina after being threatened with a screwdriver; Abu Sneina denies this. A plain-clothed Israel Police officer was caught on film shooting at a Palestinian resident of East Jerusalem last Monday, following an apparent argument between the two. The officer said he opened fire on Mahmoud Abu Sneina, after the latter threatened him with a screwdriver. Abu Sneina, however, claims he was not even in possession of a screwdriver at the time of the incident. Abu Sneina was arrested and freed on bail Thursday morning, charged with assaulting a police officer with cold steel, possession of a knife and threats. According to police, Abu Sneina tried to attack the officer with a screwdriver after an argument between the two at a gas station in Sheikh Jarrah neighborhood in Jerusalem. The police officer fired a warning shot in the air and then shot Abu Sneina in the leg. Police further claim that Abu Sneina then took the screwdriver and escaped. Abu Sneina says the only object he was holding at the time was his keys. Furthermore, he says he did not understand that the man was a police officer, since the latter only identified himself as a policeman after the shooting. Abu Sneina says that he collapsed shortly after he drove away, not far from the scene of the event. A passing driver took him to a Ramallah hospital, fearing that he would be detained. 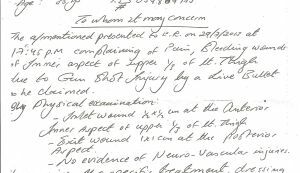 A medical document obtained by Haaretz states that Abu Sneina was wounded by a "live bullet." Abu Sneina returned to Israel on Wednesday and turned himself in, after lodging a complaint with the Police Investigation Unit. Footage from the security cameras in the gas station shows Abu Sneina driving around the officer's car, which was parked in the middle of the path. Abu Sneina is then seen stopping suddenly and walking toward the policeman. Apparently, that is when the argument between the two began. The two were out of the cameras' range for a few minutes, after which the policeman can be seen chasing Abu Sneina. Several seconds later, the policeman is seen with his gun, while the two are still arguing. Later the officer is seen shooting in the direction of Abu Sneina's thigh. The footage does not show the officer making any effort to arrest Abu Sneina. Although the officer said that Abu Sneina tried to flee, the footage shows that he remained in the gas station area for a further two minutes. Later the policeman is seen picking something up from the floor – Abu Sneina's relatives say it was the bullet casing. Jerusalem police say that an initial investigation indicates that the officer acted properly, but the case has nevertheless been brought to the internal Police Investigation Unit for further examination. Atta Muhammad Atta Sabah is a 12-year-old Palestinian boy who was shot by an Israeli soldier on 21 May 2013 in Jalazoun refugee camp near Ramallah in the occupied West Bank as he attempted to retrieve his school bag. The injury left him paralyzed below the waist and damaged his liver, lungs, pancreas and spleen. Contemporaneous reports include typical Israeli army assertions that soldiers were firing at protestors throwing rocks and molotov cocktails. Atta says “I’m not expecting anything to happen to [the soldier who shot me].” Israeli soldiers are almost never charged with crimes against Palestinians civilians, and, when they are, punishments are insignificant. “No, I didn’t hear anything [from the Israelis] nor did they care about the situation,” Atta said. The Israeli occupation forces (IOF) clashed at dawn Wednesday with Palestinian young men and kidnapped a senior Islamic Jihad official in Jenin city. Local sources reported that Israeli soldiers aboard more than 15 military vehicles stormed Jenin city at dawn and kidnapped Sheikh Abdul-Halim Izzuddin, a leading Islamic Jihad figure. During the campaign in the city, the IOF violently subdued angry young men, who threw stones at them. Many young men suffered tear gas suffocation during the clashes. 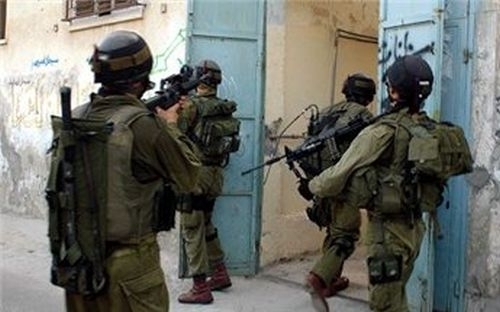 The IOF also raided the eastern district of the city and kidnapped a young man named Ahmed Hathnawi, 28, from his home. 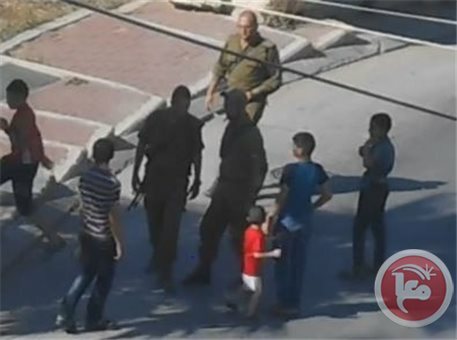 Dozens of Israeli soldiers invaded Beit Ummar town, north of the southern West Bank city of Hebron, kidnapped two children, and injured five Palestinians. Mohammad Awad, coordinator of the Popular Committee Against the Wall and Settlements in Beit Ummar, stated that dozens of soldiers invaded the town, and kidnapped two children identified as Mustafa Mohammad Awad, 16, and Ramzi Abdul-Hamid Al-‘Allamy, 15. Both children were taken prisoner from their homes, while the soldiers also violently attacked and beat Al-‘Allamy. Awad added that violent clashes took place in the town as local youths hurled stones at the invading soldiers. The army fired gas bombs and dozens of rubber-coated metal bullets. He said that resident Ahmad Khalil Abu Hashem, 21, was shot by a rubber-coated bullet in his left shoulder, and another resident identified as Aktam Yousef Ikhlayyil, was shot in his abdomen and right arm. They were moved to the Hebron Government Hospital suffering moderate injuries. Three more Palestinians suffered mild injuries after being hit by rubber-coated metal bullets, and were treated by local medics; their injuries did not require hospitalization. Furthermore, Red Crescent medics provided treatment to a number of residents who suffered the effects of teargas inhalation. Several families had to leave their homes at dawn due to the large number of gas bombs fired by the army. Awad said that clashes took place in several main areas in the town, and that a number of youths hurled Molotov cocktails at a armored Israeli military vehicles; one armored troop carrier was burnt, no injuries have been reported among the soldiers. Several soldiers also broke into a number of homes, and violently searched them causing property damage, and terrifying the residents, especially the children. Earlier on Wednesday, dozens of soldiers invaded the northern West Bank city of Jenin, and kidnapped one resident. Another resident was also kidnapped in Teqoua’ village, near Bethlehem. Israel soldiers invaded Palestinian communities in the occupied territories on a daily basis, violently break into and search local homes, and kidnap residents. Israeli military sources have reported (Wednesday August 7, 2013] that four soldiers suffered mild to moderate injuries in an explosion that took place near the northern border with Lebanon. The wounded soldiers were moved to an Israeli hospital in Nahariya; three of them were moved to surgery while one was moved to the intensive care unit, Israeli Ynet News reported. Ynet said that this is the first attack in the area since the second war on Lebanon that took place seven years ago. Gunfire also took place in the Naqoura area in southern Lebanon, while sounds of two blasts have been heard. 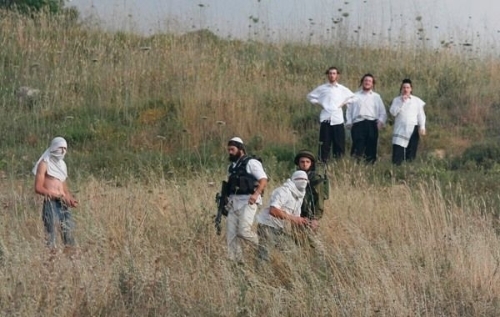 The Ynet added that Israeli soldiers fired several illumination bombs near the border area. According to the Al-Manar TV, run by the Hezbollah Party, the explosion that targeted the Israeli army took place on the Lebanese side, just six meters away from the border. Meanwhile, a Lebanese security official stated that the explosion took place after the Israeli army advanced 150 meters into southern Lebanon. The Israeli army did not provide further details on the incident while a military commander stated that the situation in the border area has been volatile due to the events taking place in Syria, and Hezbollah activities near the border area. Four IDF soldiers sustained light to moderate injuries near the Lebanese border as a result of an explosion on Wednesday. The soldiers were taken to a hospital in Nahariya suffering mainly from shrapnel wounds. Three underwent surgery and one is in the intensive care unit. Three of the four are set to be discharged in the coming days. The border area has largely been calm since the end of the Second Lebanon War seven years ago. Lebanon's state news agency reported that the incident occurred when a mine exploded while the soldiers were 150 meters deep inside Lebnon. A statement issued by the Lebanese Armed Forces said, "Israeli forces violated Lebanese sovereignty tonight. Patrols crossed the Blue Line (border demarcation) and went 400 meters into Lebanon." Prime Minister Benjamin Netanyahu said, "IDF soldiers protect us and our borders. This was the case tonight." Speaking during a tour of a military compound in the Negev, he added "We shall continue acting responsibly to secure Israel's borders. I wish the men a swift recovery." Lebanese media reported of two blasts in the Naqoura region followed by sounds of gun fire on Wednesday morning. It was further reported that the IDF fired illumination bombs in the border area. Hezbollah's Al-Manar TV reported that the explosion was on the Lebanese side, six meters from the border. A security source said traces of blood were found near a hole in the road adjacent to the al-Labouna area. However, a Lebanese security source told local radio that the blast occurred when an IDF patrol was 150 meters deep inside Lebanon. The IDF's Spokesperson's Unit said in response, "The IDF is investigating the event and monitoring developments. We shall continue to secure the northern border." No other details were available. Israeli troops deployed along the northern border have been on heightened alert since Syria's civil war began to spillover into Israel and Hezbollah became involved in the fighting. The Lebanese army says Israeli soldiers who were wounded near border had crossed 400 meters into Lebanese territory. "Last night Israeli forces violated Lebanese sovereignty. 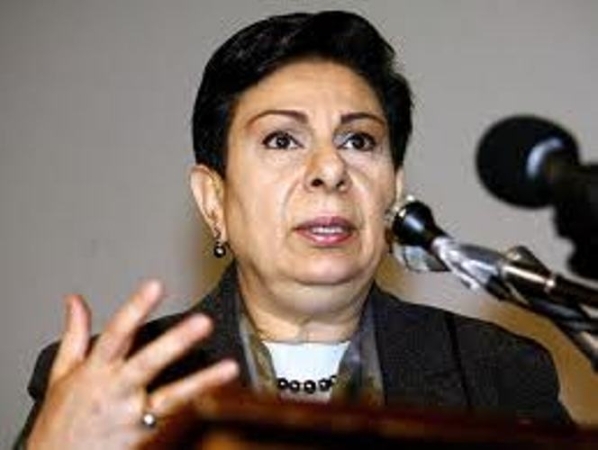 We will investigate the incident along with UNIFIL," the Lebanese Army said in a statement. IDF: 4 soldiers slightly injured in bombing by northern border Four soldiers were injured lightly to moderately following an explosion along the northern border during military operations. 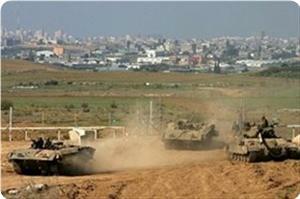 The IDF Spokesperson said that the soldiers were taken to the hospital for medical treatment. The incident is under investigation. According to Wadi Hilweh Information Center, the Israeli police raided the Silwan area in East Jerusalem on Monday, attacked two Palestinian minors, and arrested another. The Information Center reported that this incursion involved an undercover Israeli unit, intercepting the minors as they were going home. The unit also lashed out violently at families, when they attempted to prevent the attacks on these children. Cabinet congratulated, during its meeting in Ramallah Tuesday, chaired by Dr. Rami Hamdallah, the Prime Minister of the caretaker government, the Palestinian people and the Arab and Islamic nations on Eid Al-Fitr, and wished to have a blessed one and for the freedom and independence of the State of Palestine with East Jerusalem as its capital, and stressed that the specialized governmental committees are functioning responsibly when it comes to controlling prices and protecting citizens from exploitation during the festive period, in addition to the distribution of the financial assistance to the needy citizens. 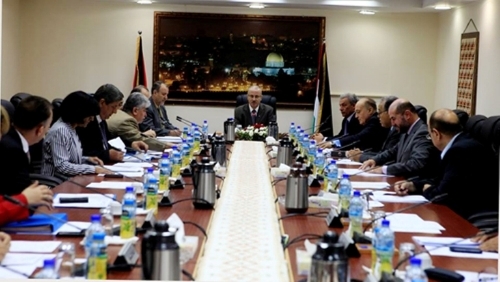 In another context, Cabinet condemned the continuing violations of the army and settlers against Palestinian civilians and their properties, in addition to the latest decision of the Israeli government which supports more than 90 settlements in the West Bank and East Jerusalem, and the attacks and beating against Palestinian children at a military checkpoint in the south of Hebron and Bethlehem, as well as the smashing of more than 15 vehicles by settlers in the south of Nablus and the attacks on farmers and shepherds which caused the death of many of their cattle in the south of Nablus. Cabinet warned of the Minister of the Israeli Economy's call to kill Palestinian prisoners immediately after their arrest which was seen as a clear threat, it also called on the international community and human rights organizations to hold responsible to protect the Palestinian prisoners and compel Israel to the international law and to stop its violations against them and save the lives of the prisoners on hunger strike, especially Jordanian prisoners who have been suffering from critical health conditions. In a separate context, Cabinet welcomed the initiative of the Palestinian leadership in Syria, which requires the departure of all Syrian militants in the Palestinian refugee camps and to emphasize the neutrality of the refugee camps from the Syrian conflict, it also called on the Syrian parties to abide by the terms of the Palestinian initiative about the ongoing conflict and stop the killings of our people. Several armored Israeli military vehicles invaded, on Wednesday at dawn [August 7 2013], the northern West Bank city of Jenin, and kidnapped one resident; clashes and injuries have been reported. One resident was also kidnapped in Bethlehem. Local and medical sources in Jenin have reported that more than 12 military vehicles invaded the city just before dawn prayers, and added that the invasion targeted the southern area, especially the Jaffa Street area. At least two Palestinians have been treated for the effects of teargas inhalation, while the soldiers also broke into the home of resident Abdul-Halim Ezzeddeen, violently searched the property and kidnapped him before taking him to an unknown destination. 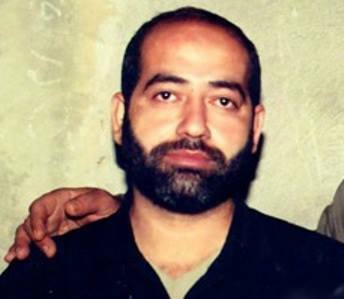 Local sources said that Ezzeddeen, a political leader of the Islamic Jihad Movement, was interrogated in his home before the army kidnapped him. Furthermore, clashes took place at the Ministry Of Interior Junction in the city, while the soldiers fired dozens of gas bombs and rubber-coated metal bullets at local youths who hurled stones and empty bottles at the invading soldiers. Two least two Palestinians received treatment for the effects of teargas inhalation. In related news, dozens of soldiers invaded the Teqoua’ village, west of the West Bank city of Bethlehem, and kidnapped one resident identified as Mohammad Nasser Ta’amra, 20. 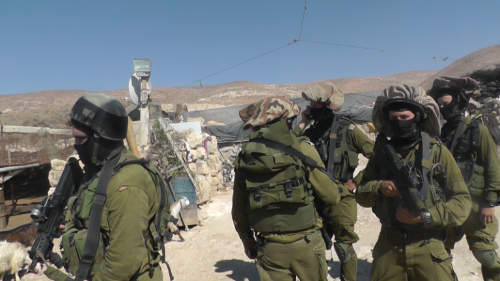 Local sources said that the soldiers searched the home of Ta’amra before kidnapping him. Israeli occupation forces (IOF) advanced to the east of Breij refugee camp in central Gaza on Tuesday morning and bulldozed land. Local sources told the PIC reporter that the soldiers escorted six huge bulldozers that leveled land near the refugee camp. The incursion is the latest of a series of IOF violations of the calm agreement concluded in November last year. Local sources have reported that several armored Israeli military vehicles and military bulldozers, carried out a limited invasion into the Al-Boreij refugee camp, in central Gaza, and uprooted farmlands. The sources said that six military bulldozers, accompanied by several jeeps, invaded the area, and fired several rounds of live ammunition before uprooting the lands. The bulldozers and armored vehicles also invaded an area close to the Juhr Ed-Deen nearby village. The army carries out nearby daily limited invasion into different areas of the coastal region, especially border areas in the northern and eastern parts of the Gaza Strip. Dozens of casualties have been reported due to army fire during these invasions. The invasions are direct violations to the ceasefire agreement mediated by Egypt, in November of last year, between the resistance in Gaza and Tel Aviv. Israeli police assaulted late Monday two Palestinian minors and arrested a third following a raid of the East Jerusalem neighborhood Silwan, Wadi Hilweh Information Center said Tuesday. It said an undercover Israeli unit surprised the minors while they were on their way home attacking two before arresting a third. Members of the unit also attacked families who intervened on behalf of the children. Clashes broke out after Sunday midnight between the Palestinian young men and Israeli forces in Damascus Gate in Jerusalem. The Israeli forces heavily fired sound bombs towards the young men and the passers-by; they were also sprayed with pepper spray which led to the injury of a few people. Several Palestinians Monday suffered from suffocation due to gas inhalation after Israeli soldiers fired tear gas canisters towards Palestinians in the vicinity of al-Khader football stadium in al-Khader town, south of Bethlehem, according to local sources. They told WAFA that forces deliberately fired tear gas canisters towards Palestinians while they were leaving the stadium, causing several suffocation cases among them. They were all treated at the scene. 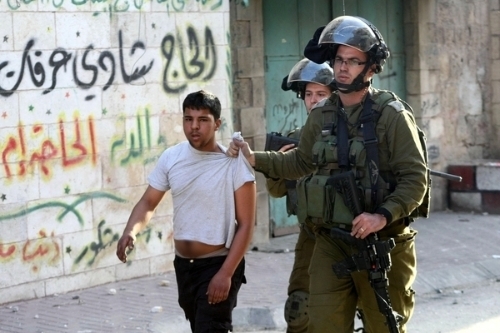 An Israeli soldier assaulted a Palestinian child in Hebron on Saturday, a local group said. Youth Against Settlements uploaded a video on YouTube documenting an incident in the Israeli settlement of Tel Rumeida, situated in the heart of the Palestinian city of Hebron. An Israeli soldier can be seen slapping and kicking a young boy, before chasing another young child. The video was filmed by ISM, Hebron. Youth Against Settlements said that this kind of violence by Israeli soldiers is a daily occurrence. Settler violence against Palestinians in Hebron is routine, with Israeli soldiers rarely intervening to prevent attacks. Israel's military is often involved in arbitrary assaults on Palestinians in the city, locals say. Israeli authorities want to evict 1,300 Palestinians from their homes in the south Hebron hills, in the West Bank, claiming they reside in an army military training firing zone. According to Haaretz Israeli newspaper, Israeli authorities seek the eviction of Palestinians in that area because training there could save the Israeli Occupation Forces time and money. Yet they never ask to evict Israeli settlement outposts in the same area. Israel's Attorney General submitted on Tuesday a memorandum to the Israeli Supreme Court saying that the eviction of 1300 Palestinians living in a "firing zone 918" will save the IOF time and money. The prosecution issued the memo in response to the two petitions filed by the Palestinians from the villages threatened with demolition in January 2013 to stop planned evacuation of the villages and to cancel the military order to close the area in front of them. It's worth noting that these Palestinian villages have existed dozens of years ago , yet the Israeli Army decided to convert it to a military training zone and demands the eviction of Palestinians from their villages. In July 2012, an Israeli court issued decision to evacuate four Palestinian villages out of eight the Army demanded to demolish, with the support of the Israeli Defense Minister Ehud Barak. According to Israeli law experts, the eviction of the Palestinians violates the International Law and could lead Israel to the International Criminal Law in Lahai. On Thursday, dubbed the Day of Rage, thousands of Palestinians gathered in areas occupied by the Israeli state to protest PRAWER, a plan that would forcibly displace 30-40,000 Palestinian Bedouins from the Negev-Naqab dessert, if it went effect. Throughout the region more than 20 protesters have been arrested. The protest was guarded by approximately 150 military trained Israeli Occupation Force officers, equipped with tear gas, stunt grenades, rifles, and horses for dispersing the crowd. The protesters broke the barriers set up by the Israeli Offensive Forces. However, male elders from the crowd stopped protestors from moving toward the intersection which they had hoped to block off. The demonstration remained peaceful. At around 6:30 protesters began to disperse. As the crowd of news reporters thinned out, Occupation officers claimed that rocks had been thrown at them, and arrested a young man. The innocent man’s friend objected to the arrest, and was imprisoned as well. Both men had a court hearing this morning. An international PNN volunteer was punched in the face by an Occupation Force officer while filming the arrests. Other protests occurred in the Galilee village of Rayna at the Aara Junction in the north and at a junction near Wadi Ara, where around twenty demonstrators were arrested and the occupation force used tear gas to disperse the crowd which attempted to block Route 65. 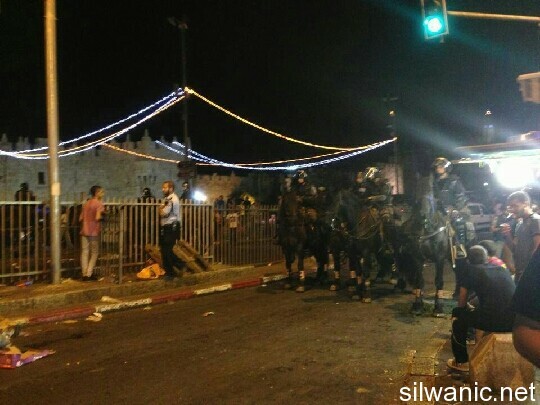 Later in the evening protestors gathered in East Jeruselem, succesfully blocked the streets with their march, until they were dispersed by officers on horseback throwing stunt grenades. About half the Bedouin population of the Naqab (40,000 people) live in 35 villages, the majority which pre-date the establishment of the Israeli state. Israel treats them as unrecognized villages and ‘illegal communities,’ denying them essential services such as electricity, running water, transportation networks, and medical, postal, and educational services. Israel considers construction within these villages as illegal and regularly demolishes the homes of the residents. 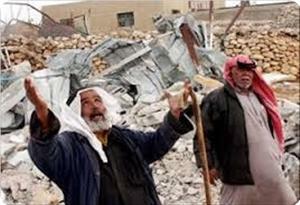 The Israelis have demolished the village of Al-Arakib more than fifty times. Dozens of protesters on Friday were lightly wounded in demonstrations across the occupied West Bank to mark the annual Jerusalem Day and to protest Israel's so-called Prawer Plan for the Negev. 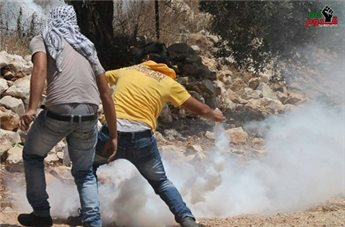 Dozens suffered tear gas inhalation in Kafr Qaddum near Qalqiliya as Israeli forces used stun grenades and tear gas to disperse protesters. They were treated on the spot. The demonstration was called by Fatah to mark Jerusalem Day and to protest Israeli polices in Jerusalem. A spokesman for the demonstrators, Murad Eshtewi, said that the demonstration was in sync with demonstrations all around the world in support of Jerusalem. 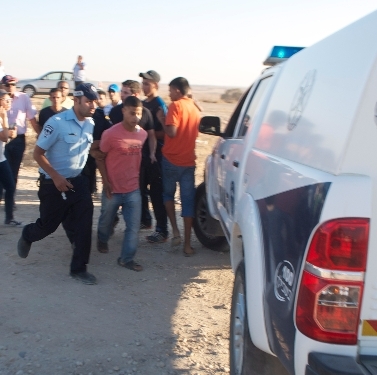 In Nabi Saleh, near Ramallah, dozens of activists marched to the confiscated land of the village in protest against settlements, the Prawer Plan, and in support of prisoners. Israeli force dispersed the protesters using tear gas and water cannons and arrested four Israeli activists for entering a closed military zone. In Bilin's weekly march, dozens suffered tear gas inhalation as they marched to protest Prawer Plan and mark Jerusalem Day. Israeli soldiers fired tear gas and rubber-coated steel bullets and stun grenades at the protesters as they neared the wall. [Thursday evening August 1, 2013] Israeli soldiers and police officers attacked dozens of Palestinian protesters nonviolently marching in occupied East Jerusalem against the Prawer Negev displacement plan. The protesters carried Palestinian flags, signs denouncing the plan and Israel’s policies against the Arabs and Palestinians in the country, and chanted against the Prawer plan. Local sources have reported that the army and police used excessive force against the nonviolent protesters and struck them with batons before throwing concussion grenades at them. Several protesters suffered cuts and bruises to various part of their bodies, and received the needed medical treatment. 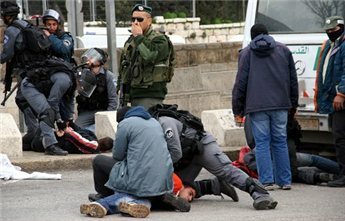 The soldiers kidnapped two Palestinians in Nablus Street and Bab Al-‘Amoud in East Jerusalem, and violently attacked them. 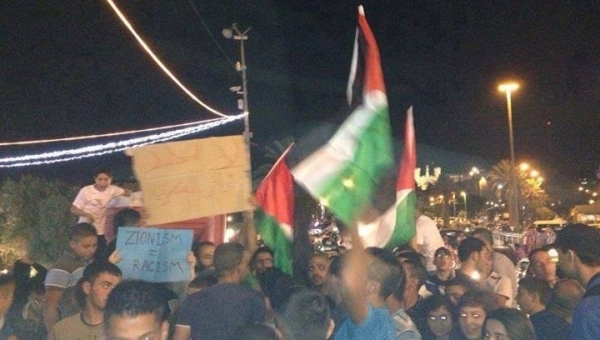 The protest started in Bab Al-’Amoud before the protesters marched to Salah Ed-Deen Street, and Sultan Suleiman Street and heading towards Nablus Street, close to the American Consulate. Mounted Policemen then attacked the protesters, preventing them from reaching the U.S. Consulate, and kidnapped one protester. Clashes have also been reported in Nablus Street and Bab Al’-Amoud after the police attacked the protesters who responded by throwing stones and empty bottles. The “Prawer plan” calls for annexing more than 700.000 Dunams (185329 acres) and displacing the residents by demolishing 14 villages in the area. All unrecognized villages in the Negev are under continuing Israeli attacks and violations, as Tel Aviv does not recognize the residents' right to live on their land -- land they inhabited long before the 1948 creation of the state of Israel in historic Palestine. Unrecognized villages in the Negev are under continuing Israeli attacks and violations, as Tel Aviv does not recognize the residents' right to live on their land -- land they inhabited long before the 1948 creation of the state of Israel in historic Palestine. The Israeli occupation forces (IOF) threatened to demolish Palestinian homes in Jordan Valley, particularly in Yarza area and on the outskirts of Tubas, unless the Bedouin residents recognize in writing that Israel owns their lands. Some of the resident were handed written warnings and others were verbally notified about the Israeli army's intention to evacuate their villages by force and knock down their homes. Mokhles Masa'eid, head of the Yarza village council, told the Palestinian information center (PIC) that the notifications demanded the Bedouin residents in these areas to recognize the civil administration of the Israeli army and its authority over their lands if they wanted to keep living in their villages. Masa'eid said that the Israeli army claims that these Palestinian villages in Jordan Valley are a closed military zone belonging to Israel, noting that the citizens own documents proving their ownership of their lands. He also pointed out that a large number of their homes are located on the outskirts of Tubas city and considered an important part of the city. Israel's Channel 10 published a video on Wednesdayfeaturing an Israeli soldier, dressed in civilian attire, assaulting a group of Palestinian workers in the Jordan Valley without justification. This video was published four years after the incident took place in April 2009. It reveals a group of workers standing at the main entrance of a settlement near the Palestinian village of Fasayel, in the southern Jordan Valley, waiting waiting to be picked up and taken to their workplace. 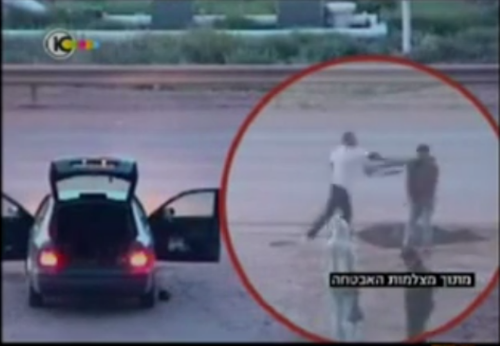 The video shows an Israeli soildier stepping out of a car, taking out his M16 pistol and assaulting the workers for no reason. 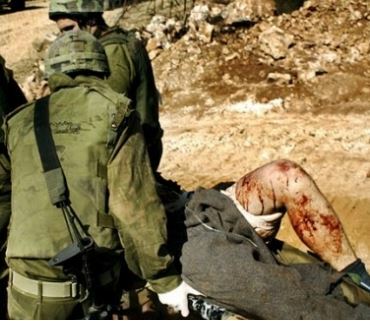 The soldier severely beat three unarmed Palestinian workers. 15 days later, the workers filed a lawsuit against the soldier and the Magistrate's Court in Jerusalem. Although a surveillance camera, located at the entrance of the settlement, caught the brutality of the attack on video, the court justified the soldier's actions under the precedence that he had difficult experiences during his service in the West Bank. He was only sentenced to two months in prison. 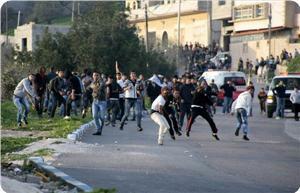 Clashes erupted between Palestinians and settlers near the village of Asirah al-Qabaliya, south of Nablus. Witnesses said that Israeli settlers threw stones towards a number of workers who were building a water tank in the village, adding that the village has been exposed to several settler attacks during that past few weeks. They also added that clashes erupted between the workers and settlers who tried to burn the water tank several times during the past weeks. 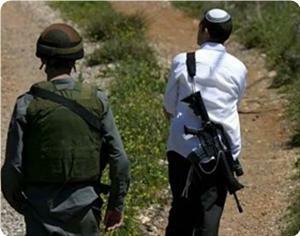 Jewish settlers attacked construction workers in Assira Al-Qabaliya village, south of Nablus, on Wednesday morning. Ghassan Daghlas, an anti-settlement activist, said that the settlers threw stones on the workers, who responded likewise. Meanwhile, violent confrontations were reported in Beita village, also south of Nablus, after Israeli occupation forces raided it on Tuesday night. Local sources said that IOF soldiers in ten armored vehicles stormed the village shortly after midnight and set up a roadblock west of the village and searched all passing vehicles. The Israeli occupation forces (IOF) violently attacked at dawn Tuesday Palestinian citizens in Jenin refugee camp and kidnapped a mosque imam. Local sources reported that the IOF stormed the camp suddenly and in a violent way and deployed themselves in different areas before they clashed with Palestinian young men. They added that the IOF fired a hail of tear gas and live bullets at the young men, resulting in the injury of several of them. Three of the young men suffered bullet injuries in different parts of their bodies and were rushed to hospital. The sources affirmed that the IOF kidnapped during the campaign Sheikh Mohamed Shabrawi, the imam of Mahmoud Tawaleba Mosque. The IOF also intensified their presence in the vicinity of Khalil Suleiman hospital near the camp and embarked on searching the area until early morning on the same day. The Israeli navy will hold a drill on early morning Wednesday in the Haifa bay area. Due to the drill, heavy traffic of IDF vehicles may be seen and explosions heard in the area. According to Israeli media, another Israeli attack on Syria has taken place on Saturday. Also various Syrian opposition groups have confirmed the attack as more and more the insurgents in Syria seem to be coordinated with Tel Aviv. Dr. Kevin Barrett from Muslim-Jewish-Christian Alliance and US National Security analyst, Lawrence J. Korb discussed this issue live on Press TV. 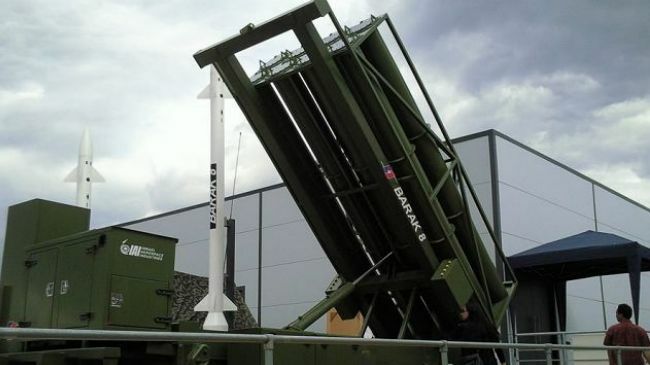 The Israeli military has begun equipping its main warships with Barak 8 - a medium-range surface-to-air missile. The missile is being installed on Sa’ar 5-class warships, Israeli media reported on Sunday. The new missiles are co-developed by India and Israel. The missile’s radar allows operators to simultaneously engage multiple targets, and intercept an incoming missile as close as 500 meters from a naval craft. The Tel Aviv regime had put off the equipping process for years. The missiles, which have a maximum operational range of 70 kilometers, are aimed at countering Russian-produced “ship killing cruise missiles” said to be in Syria’s possession. There has been no comment by the Israeli military. On July 5, US officials confirmed that Israeli warplanes bombarded an arsenal containing advanced Russian-made Yakhont anti-ship missiles in Syria, Israeli newspaper Haaretz reported, citing the CNN. Other Israeli media outlets said Tel Aviv launched the July 5 strike in order to hit the Russian-made missiles. The Israeli regime is already believed to have been involved in at least three airstrikes against Syria this year. Last month, the Israeli regime confirmed that it had deployed nuclear-tipped missiles on Dolphin-class submarines imported from Germany. The Dolphins are small, diesel-powered submarines, designed for coastal patrols and are capable of carrying nuclear warheads. 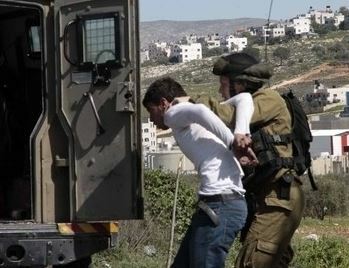 Israeli occupation forces arrested on Monday, seven Palestinians after raiding their houses in different areas in Hebron, while arrested a Palestinian from the city of Bethlehem in the occupied West Bank. In Al-Aroub Refugee Camp, north of Hebron, Israeli forces arrested three minors including Abdul Karem Jabr al-Titi, 16, after raiding his family house. They detained and harassed his family members. Journalist Alaa al-Titi, brother of the detained child, said that a military force from the Israeli Army violently raided the family house, detained them in one room and fired tear gas canisters, causing suffocation to 20 members including his pregnant sister. 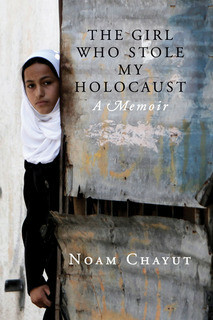 He also added that Israeli soldiers severly beat his 20-year-old brother Shamekh. Israeli soldiers arrested the 16-year-old Palestinians: Muhath Abu Hashhash, and Hatem Mahfouz after raiding the camp following confrontations erupted with the Israeli forces. Israeli forces arrested three youngsters from Ethna village, west of Hebron. They are: Jabriel Tumaizi, 21, Hisham Tumaizi, 21, and Rami Abu Jahshiyeh, 26, after several military vehicles raided the residential blocs in the village at dawn. In the city of Hebron, the 27-year-old Omar Yacoub al-Mohtasib was arrested. In Bethlehem, the Palestinian Akrama Odeh al-Amour, 18, was arrested after raiding and searching his family house in the village of Tkou, east of Bethlehem.